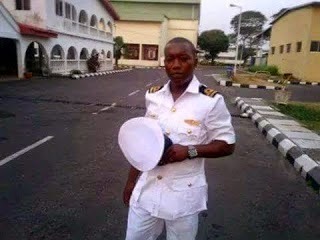 Young naval officer Commander Ugbodi from Oori town of Benue State has been killed. According to a CKN News reporter at the scene of the incident,the naval officer was mistaken for a robber with his friends and who pursued their car .The mob made up of Okada riders killed and set them on fire before they could even explain and identify themselves.. Here is the story as sent to CKN News by Pastor Flourish Atoju . "He is my brother CKN, the whole of my village is thrown into mourning right now. He was in the company of his younger brother to go get fuel. He arrived at a police check point and the police on duty told him to stop because of the robbery going on; i don't know why he just drove pass the police, the okada people ran after him, seen that he stopped for them, the next thing was to drag him out of his vehicle together with his younger brother, beat them up to the point of death and set them ablaze. It happened in Abuja on your way to kaduna. His name is Awi Samuel Ugbodi. So painful and can't just stop crying."